In this Dec. 16, 2018, file photo, migrants gather in the third shelter opened to migrants in Tijuana weeks after thousands from the migrant caravan arrived in the border city in Tijuana, Mexico. This newest shelter is located in a warehouse blocks away from the first shelter which was shuttered due to sanitation issues. 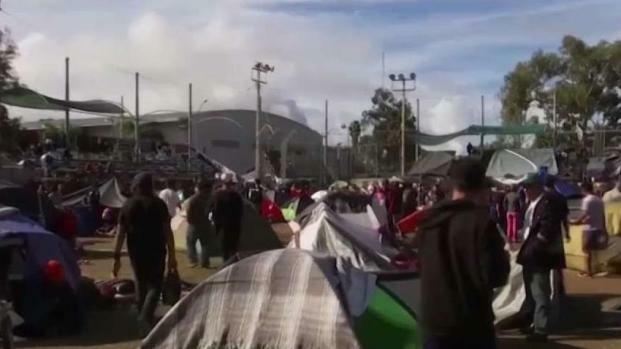 Many of the thousands of migrants who have arrived at the border in a caravan had planned to request political asylum in the United States after traveling more than 6 weeks from Central America. U.S. border officials only process a limited number of asylum cases per day, leaving many migrants to choose between crossing illegally or possibly waiting for months in shelters in Mexico for U.S. asylum hearings. The Trump administration's decision to make asylum seekers wait in Mexico while their cases wind through clogged U.S. courts was announced with crucial details still unknown — a move that creates uncertainty along the border and possibly an incentive for people to cross illegally before the change take effect. The policy shift would force asylum seekers to stay in often-dangerous Mexican border cities as they navigate the American immigration court system. On Friday, little had changed at Mexico's busiest U.S. border crossing, where Mauricio Gomez of Nicaragua joined about 150 others to learn if his name would be called to claim asylum. "We are aware of the news, but nothing has happened so far," said Gomez, 41, who hoped to join a cousin in Nebraska. "We don't know when they are going to implement it." 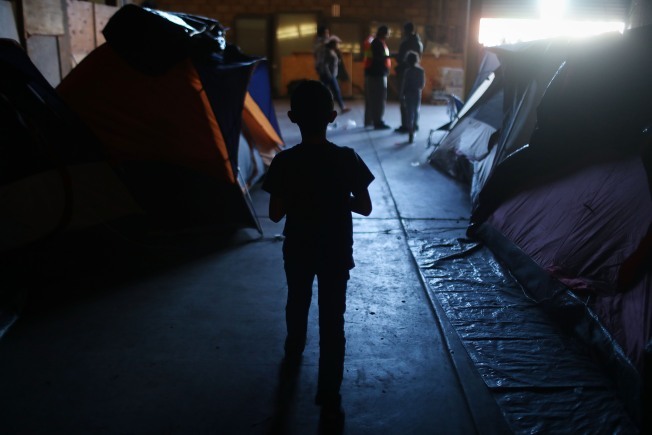 Details were missing when the U.S. announced the policy Thursday in response to a large and growing number of Central American asylum seekers, many of them families, who are typically released in the United States while their cases are adjudicated, a process that can take years. The process at the border remains status quo until specific new procedures are put in place. Homeland Security Secretary Kirstjen Nielsen said the next step was "more legal paperwork" with Mexico. "So, we'll work on a technical agreement with them, but we have our teams working on that now," she told Fox News on Friday. The U.S. characterized the policy as a unilateral move, but Mexico almost simultaneously said it would grant foreigners permission to stay in the country while their asylum claims are considered in the U.S. and that they could seek work authorization. The two governments have been in discussions for months, and the timing of the twin announcements suggested a high level of cooperation and coordination. A Homeland Security official, speaking to reporters Thursday on condition of anonymity, said some details were expected in the coming days and that the policy would be rolled out in phases at different locations on the border. The U.S. said the policy will not apply to children traveling alone or to Mexican asylum seekers. The mechanics may get complicated: Where will immigration hearings be held and how will asylum seekers get there? How will they communicate with attorneys? How will they be returned to Mexico? Details about implementation and "the circumstances in which people will be shuttled back and forth across the border are not at all clear," said Alan Bersin, a former Customs and Border Protection commissioner who helped negotiate repatriation agreements with Mexico as a senior Homeland Security official under President Barack Obama. Government protocols are meant to establish uniform guidelines "rather than leave it up to the operators in the field to make it up as they go along," Bersin said. Some U.S. authorities worry that any lag between the announcement and implementation may encourage some asylum seekers to cross illegally before the changes take effect. Illegal crossings surged between Trump's election and inauguration in fear of what the new president might do. Bersin said smugglers always seek to take advantage of perceived "loopholes," and they may view a lag in implementation as an incentive. There is also uncertainty on the legal front. Judges have blocked some of Trump's biggest strokes on immigration, the latest reminder coming Friday when a divided Supreme Court decided it would not let the administration begin enforcing a ban on asylum announced last month for anyone who illegally crosses the U.S.-Mexico border. Andrew Selee, president of the nonpartisan Migration Policy Institute, said elements of the rollout may be challenged in court as they become known. That could include issues such as whether phone access is sufficient to consult an attorney or what happens if the Mexican government is at fault for someone failing to cross the border in time for a court date. "All of these pieces, every logistical piece, can be litigated. This can go on for years," Selee said. "I actually wonder if this will ever be implemented." A migrant named Ismael, who declined to give his last name for fear of reprisal in his native Honduras, went to the Tijuana border crossing Friday to check his place on a list of asylum seekers kept in a tattered notebook managed by the migrants themselves. U.S. inspectors process about 100 claims a day at the crossing, and there are more than 1,800 waiting. Ismael, who has been waiting in Tijuana for nearly three months, heard about the policy change on the news and wondered when it would take effect. He was shaken by the recent killings of two Honduran migrants in Tijuana and feels unsafe and unwelcome in the Mexican border city. But, he said, returning to Honduras would be too dangerous. The United States has its laws, he said. "I don't agree, but if they send us back here, what can one do? Wait." Associated Press Writer Colleen Long also contributed to this report.